A beaming Assemblywoman-elect Gail Phoebus (R-24) being selected to take her seat on the assembly. Photo by Jennifer Jean Miller. 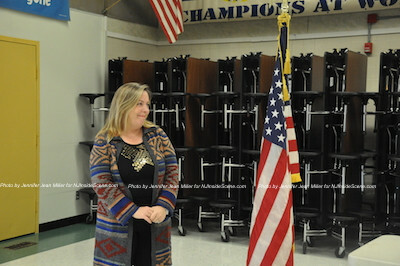 SPARTA, NJ – During a packed convention on Sat., Nov. 21 the Sussex County Republican Committee selected Gail Phoebus, assemblywoman-elect (R-24) to fill Alison Littell McHose’s vacant seat. McHose resigned in October and is now serving as Franklin Borough’s administrator, after holding the two positions since Jan. 1. 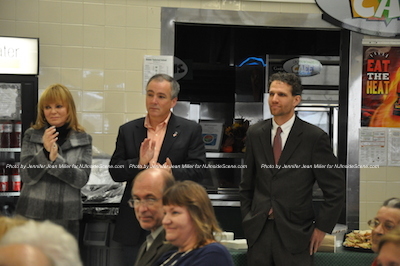 Phoebus’s swearing in took place at the Sussex County Technical School Cafeteria. 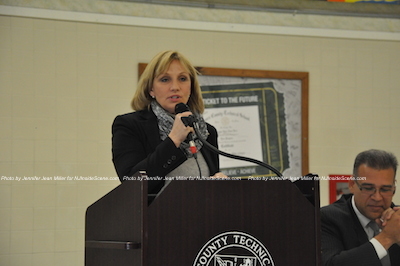 Many state dignitaries attended including Acting Governor Kim Guadagno, Labor Commissioner Hal Wirths, Senate Minority Leader Jon Bramnick (R-21) and Senator Steve Oroho (R-24). 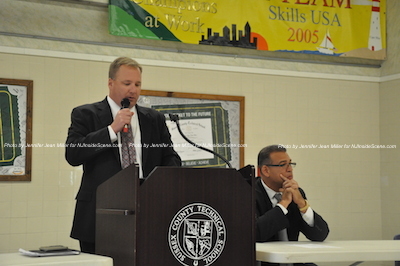 Sussex County Republican Committee Chairman Jerry Scanlan led the convention. Jerry Scanlan, Republican Committee Chairman. Photo by Jennifer Jean Miller. 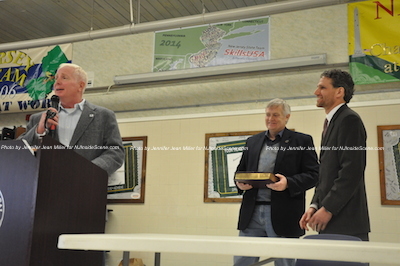 Senators Steve Oroho and Jon Bramnick, and Congressman Rodney Frelinghuysen. Photo by Jennifer Jean Miller. Additionally, from the Federal level there were Congressman Scott Garrett (R-NJ 5th District) and Congressman Rodney Frelinghuysen (R-NJ 11th District). 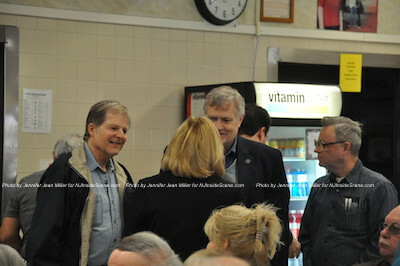 Lieutenant Governor Kim Guadagno greets Sussex County Freeholder George Graham and other constituents. Photo by Jennifer Jean Miller. Others in attendance included: Assemblyman Parker Space, Sheriff Michael Strada, Sussex County Clerk Jeff Parrott, Sussex County Freeholder George Graham, Sussex County Freeholder Richard Vohden and Morris County Freeholder David Scapicchio. After McHose was chosen to lead in the Pledge of Allegiance, McHose received a standing ovation for her service to the Assembly. Alison Littell McHose receiving commendations for her work in the assembly. Photo by Jennifer Jean Miller. Bramnick explained that he was there for the selection and election for Phoebus and said that both Phoebus and Space represented working people from family businesses. Jon Bramnick. Photo by Jennifer Jean Miller. Lieutenant Governor/Acting Governor Kim Guadagno. Photo by Jennifer Jean Miller. Guadagno congratulated Bramnick for all he has accomplished, as well as Wirths for his work on job creation in the state. 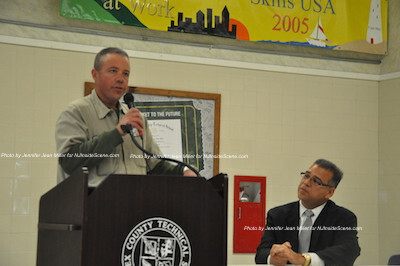 Oroho thanked everyone as well for attending and gave his nomination for Phoebus. 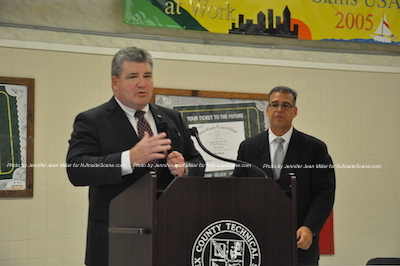 He noted how important Sussex County is within the state to have the Lieutenant Governor, Minority Leader and two Congressmen present at the event. He then shared Phoebus’s accolades – a resident of the district since 1957, Newton High School Graduate, Centenary College Graduate, wife, mother, grandmother, business operator, volunteer in the community for many years, leader in municipal government including mayor, and Sussex County Freeholder. Senator Steve Oroho (R-24). Photo by Jennifer Jean Miller. The second nomination came from Space, who said that both he and Phoebus as small business owners, relate to the struggles that small business owners endure. He also thanked McHose. From left to right: Gail Phoebus, Jill Space and Parker Space. Photo by Jennifer Jean Miller. Parker Space gives a second nomination to Gail Phoebus. Photo by Jennifer Jean Miller. Phoebus, whose full remarks are in the video below came to the podium with misty eyes. 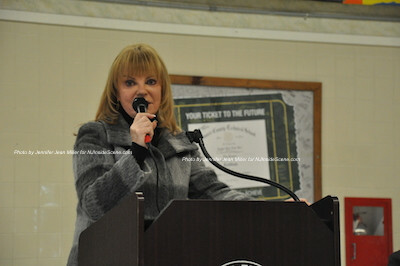 Assemblywoman-elect Gail Phoebus. Photo by Jennifer Jean Miller. Her husband and daughters were not present that day, explaining that as small business owners they were preparing for a wedding at the Farmstead Golf & Country Club. Later, she said so her daughter could work, she would babysit her grandchildren. 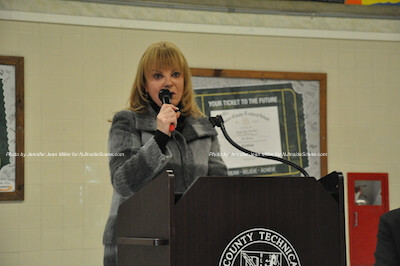 Gail Phoebus at the podium. Photo by Jennifer Jean Miller. 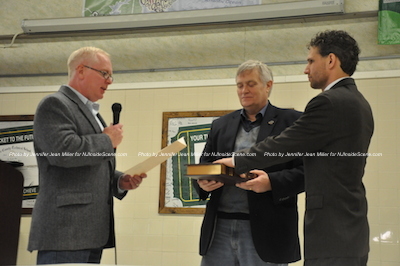 Following a brief interlude when those from Morris and Warren Counties departed, Sussex County selected and swore in the individual who would take Phoebus’s seat on the freeholder board. Sussex County Freeholder George Graham. Photo by Jennifer Jean Miller. 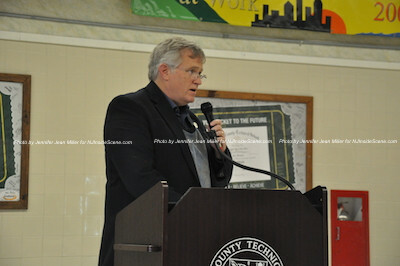 Graham first took to the podium to nominate Jonathan Rose, who was one of two elected to the post in the elections. Graham said that Rose would “make a fine fit with myself, Rich Vohden and Phil Crabb.” He also praised the younger generation of those in the party including: Rose, Lou Crescitelli, Kelly Ann Hart, Don Ploetner and Anthony Fasano. He also pointed out that Rose is an Eagle Scout and his brother had been his scoutmaster. 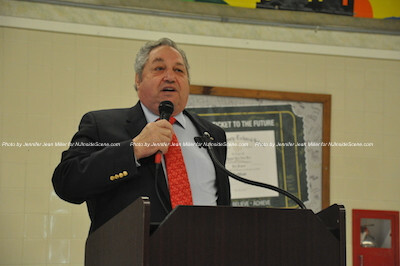 Sussex County Freeholder-elect Carl Lazzaro. Photo by Jennifer Jean Miller. The second nomination came from Carl Lazzaro, Rose’s running mate. 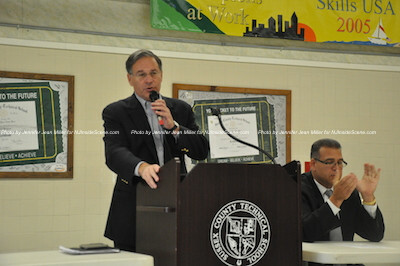 Lazzaro praised Rose for his work as mayor, which he described as a “unique responsibility,” being a mayor himself. 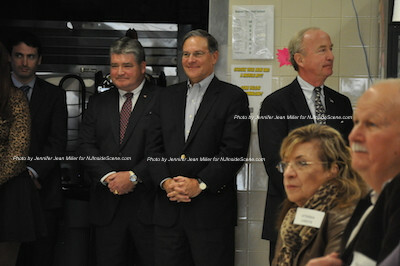 From left to right: Assemblywoman Gail Phoebus, Congressman Scott Garrett (seated), Labor Commissioner Hal Wirths and Freeholder Jonathan Rose. From left to right: Jeff Parrott Sussex County Clerk, Freeholder George Graham, and newly appointed Freeholder Jonathan Rose. Photo by Jennifer Jean Miller. 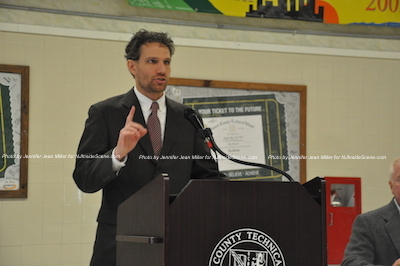 Jonathan Rose, newly elected and selected Sussex County Freeholder. Photo by Jennifer Jean Miller. 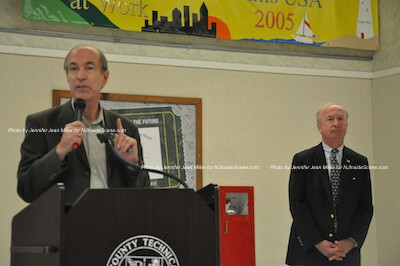 Congressman Scott Garrett (left), Congressman Rodney Frelinghuysen (right). Photo by Jennifer Jean Miller. 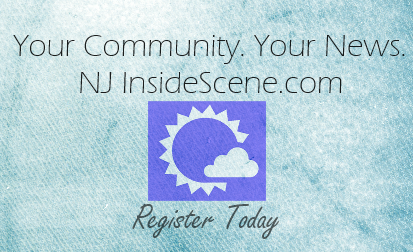 Stay on the scene with NJ Inside Scene. Become a part of Inside Scene history and click here to be a part of Inside Scene’s “Wall of Fame.” Click here to follow all of our stories on Facebook.